LAUNCH TENNESSEE is not merely dealing with "cash flow strain" and adjusting its flagship 36|86 event for v6.0 in 2018. It has also dutifully released data showing what it describes as a downturn in the pace of overall investment in Tennessee companies since 2014; and, staff have cited particular interest in an "emerging trend" of the "erosion" of the state's early-stage pipeline of deals. 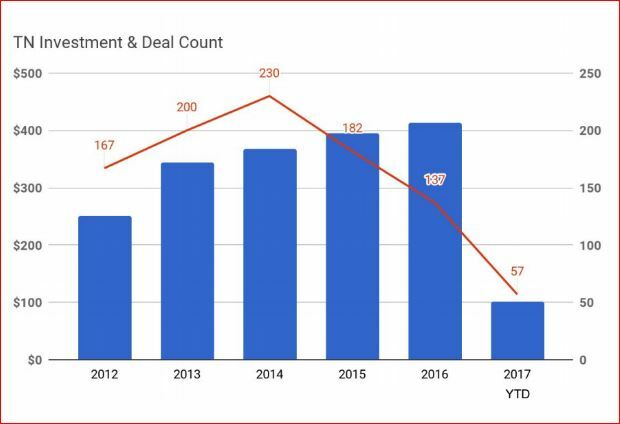 While in the most recent period median overall deal size was up 44%, the number of deals was down 32%, leaving 2017 investment roughly 46% off-pace to match 2016. Big hits skew numbers; e.g., staff reported that while MidTN continues to lead in share of capital, Eastate gained some ground due to a $25MM investment in Chattanooga-based Skuid, among other similar examples. It goes nearly without saying each time these topics come up that both the state-funded TNInvestco capital-formation program ($140MM plus invested) and the Federally funded INCITE match investment program ($29MM) are essentially spent. LaunchTN is gamely pressing forward to offer and/or administer SBIR microgrants, IMPACT matching investments, Angel Tax Credit support, nondilutive mentor networks, investor relations and more (peruse their site). But, the total immediate nominal value of these initiatives is far smaller than the nominal value of TNInvestco and INCITE infusions. No comprehensive study of the full economic impact of those programs, which are both ending on Gov. Bill Haslam's watch, has been undertaken. It has been 11 years since state government commissioned a study of Tennessee entrepreneurship and innovation by New Economy Strategies. We've heard no talk of conducting a fresh zero-based assessment of where the state stands in absolute econometric terms and in relationships to competing states. One of many related articles is here. LaunchTN (officially Tennessee Technology Development Corporation) was created by state law in 1997. EMIDS TECHNOLOGIES, the Nashville- and Bangalore-based healthcare and lifesciences IT, solutions and analytics company, filed July 25 on a $4.99MM raise, bringing total reported outside raises since 1999 to about $18MM. The company is led by Nashville-based Saurabh Sinha. The SEC report, which seems to name only existing investors, was made in the name of its holding company, Specialist Resources Global Inc. Emids announced July 17 buying Houston-based Encore Health Resources, on undisclosed terms. VNC research suggests eMids revenue is well north of $50MM annually and the company has more than 2,000 employees globally. VNC reported in 2008 that eMids had about $10MM revenue at that time and about 300 workers, altogether. The company has since added London and Dallas offices. Among those named in association with the July 25 filing is Ramesh Emani, a member of the eMids board and erstwhile president of Wipro Technologies' telecom division. He also founded Insta Health Solutions (software products for hospitals and clinics), which sold to Bangalore-based Practo Technologies in 2015. Chicago-based Baird Capital and Nashville-based Council Capital joined eMids investors via the previous round. In that 2013 raise, Brentwood Capital Advisors (BCA) was eMids' sole financial advisor. 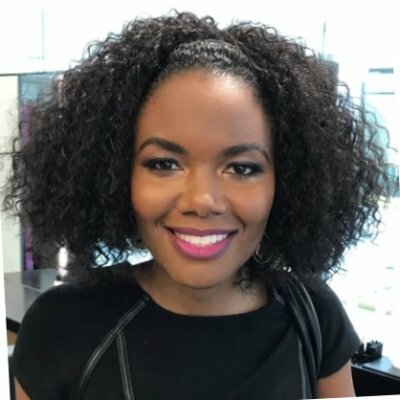 NASHVILLE-based Kimberly Lannear, co-founder CEO of Project Music grad Scripturally Sound, plans to visit the Bay Area in the next few days, "mainly for networking, and introductions to some investors and people within the tech space," she told Venture Nashville. The company's initial Seed-capital push targets $400K and Lannear aims to have 100 beta users on its app during August. Lannear said she's being very deliberate in seeking a lead investor and plans a broader market rollout this fall, targeting churches' music ministers with the company's database and platform that help professionals select Christian music and/or scriptural text that are directly complementary. The startup does not, itself, license lyrics. Scriptural citations typically anchor ministers' specific sermons and related worship content. New York City native Lannear previously raised $48K by participating in Project Music at the Nashville Entrepreneur Center and $3,500 via iFundWomen. Sector competitors include WorshipTogether.com, a webresources and event unit of Capitol Christian Music Group (Univeral Music Group), which holds its annual conference in Franklin, Tenn. Lannear also noted SongSelect (CCLI, Vancouver, Wash.). Naturally, Google, Spotify and other search and discovery engines are also relevant. Prior to earning her bachelor's in Communications at Boston University, vocalist Lannear graduated from NYC's Fiorello H. LaGuardia High School of Music & Art and Performing Arts. Lannear said her advisors via the Entrepreneur Center have included lawyer and licensing consultant Laurie Hughes; and, Baker Donelson attorney Chris Sloan. SNAPRAD is a healthtech offering being crafted by members of the Vanderbilt University Radiology community and their collaborators. SnapRad is a professional education social-media application designed to help radiology imagers and radiologists share anonymized medical images and crowd-source peers' opinions on difficult or unidentified medical findings. Informal peer opinions may be voted up or down by other participants, and extreme caution will be accorded compliance with HIPAA regulations. Again, the platform for personal education, only, not for supporting actual patient diagnoses. As previously reported by VNC, the SnapRad team presented during this spring's VUMC RADx Innovation Challenge at the VU School of Medicine. Team member Bryan Hartley, M.D., subsequently told VNC that the team expects to have some SnapRad alpha iOS-version users by early September and may be able to enter beta-stage and then make a go-nogo decision on creating a startup business during 1H2018. Once the team determines what SnapRad intellectual property can be protected, all strategic options will be considered said Hartley. 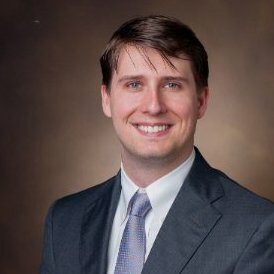 The team also includes Kevin Wilson, whose dayjob, according to LinkedIn, is that of lead application developer in the Vanderbilt University Institute for Imaging Science. Hartley, now 33, got his M.D. at Vanderbilt University, and did his residency in VU Medical Center. Hartley said advisory support has come from the RADx Challenge team and VU tech transfer and commercialization. VU's Wond'ry Innovation Center awarded the team a $3K grant, earlier this year. SANTOSH SANKAR, the founding director of the Dynamo Accelerator and Dynamo Fund in Chattanooga, announced this week that he's recruiting an Associate Investor for the Fund, which he says focuses "on early stage technology businesses that have the potential to transform commerce with a concentration in what we dub 'logistics technology' that encompasses supply chain and transportation." Candidates should have 1 to 3 years experience and some tech savvy. 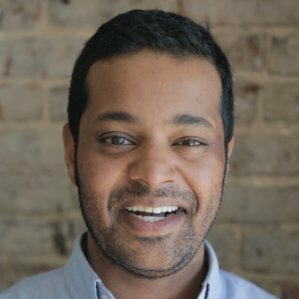 According to his LinkedIn profile, Sankar, 29, also remains active with The Lamp Post Group and is a board observer with Slope.io, the clinical-trials logistics platform startup based in Mobile, Ala. Sankar's LinkedIn is here and his personal blog is here. RELAPHI LLC, the workforce relationships, roles and performance consultancy based in Knoxville, earlier this year acquired technology assets and infrastructure of Loudon, Tenn.-based Talentsphere from founder Danny McCall. McCall then became an Angel investor in 8-month-old Relaphi. Relaphi was formed with the Talentsphere assets transaction in view, according to Relaphi CEO Tim Young. Young said the tech suite will be used in Relaphi consulting and white-labeled to others. Young and others reported to the SEC July 14 having raised just over $2MM of a potential $4.5MM target. Young told VNC that the capital raised thus far is probably sufficient, but the round remains open. Young, 50, holds controlling interest in Relaphi, which he said has 8 FTE, including Co-owner and COO Kimberly Evans, who is based in Atlanta. Relaphi's Knoxville-based advisors include attorneys Mark Jendrek (solo) and John Brock (Gentry Tipton), accounting and advisory firm Two Roads LLC, and Ackerman PR. Young banks with Capital Bank, which is being acquired by First Tennessee (First Horizon). PATENT attorney Andre "A.J." Bahou of Nashville told VNC he is accepting new clients and is in late-stage discussions with one or more potential law partners, after serving a group of clients on his own, since 2011. 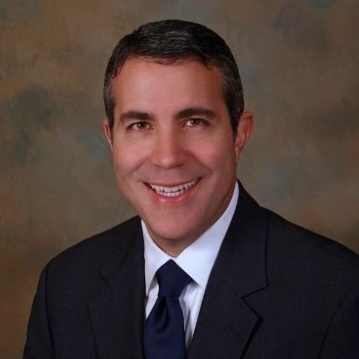 Bahou, a 47-year-old native of Murfreesboro, earned degrees in civil engineering, MBA-accounting, electrical and computer engineering and a law degree and LLM intellectual property, respectively at Tennessee Tech, Middle Tennessee State University, John Hopkins University and the University of New Hampshire. He spent six years practicing IP law in the District of Columbia, including two years with Dewey & LeBoeuf, before returning to Tennessee in 2009. His current website says he "has worked on cases involving varying technologies such as Blockchain, smart meters, virtual reality, medical devices, computer hardware, software, and Internet security systems..." Bahou confirmed that he remains VP and Chief Legal Officer for Omaha-based Prism Technologies LLC. That company was formed "to develop and invent new technologies in the computer and network security, wearable computing, transaction processing and healthcare...," according to its website. Bahou is an active member of the board of Launch Tennessee (Tennessee Technology Development Corp.) and a past president of the Tennessee Intellectual Property Law Association (TIPLA).